I'm not a good shopper. I don't like it. I don't like trying on clothes. I look at the mannequins to help plan outfits. 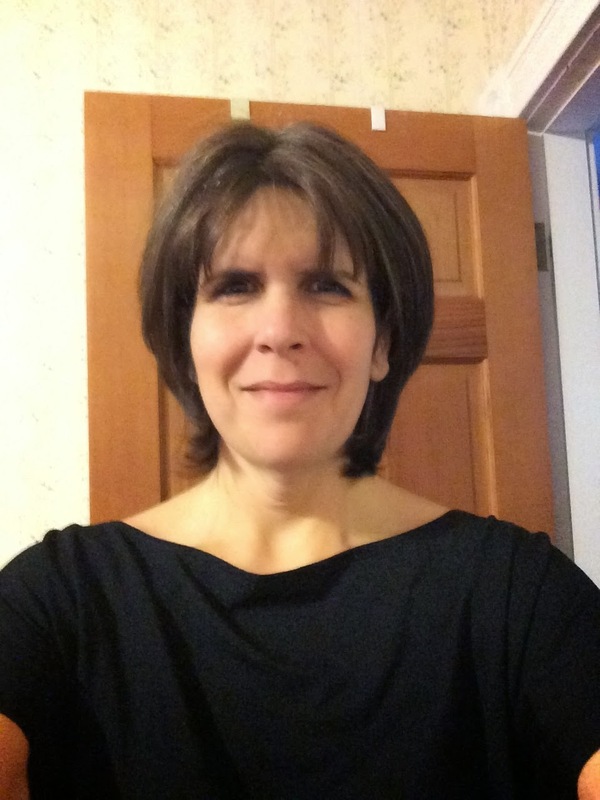 So when I first heard about Stitch Fix, I was curiously optimistic. I decided that I would give this subscription service three months and see what happened. 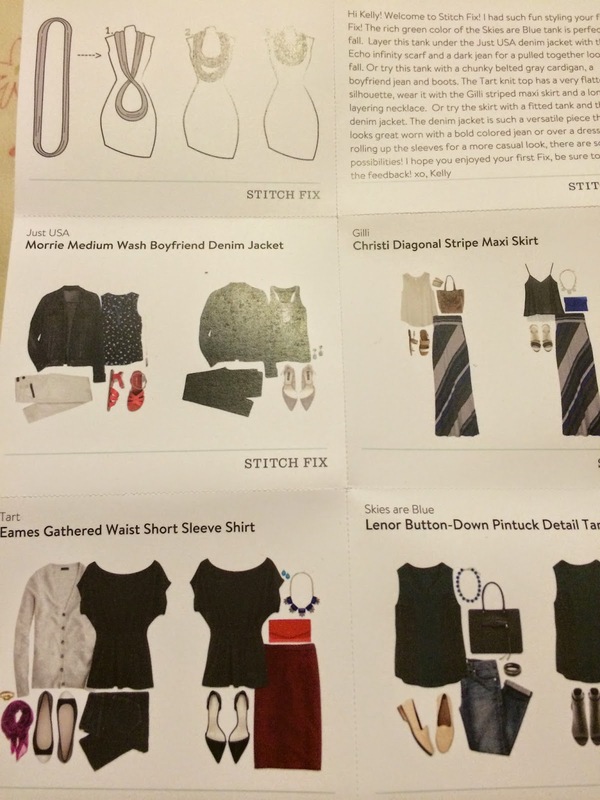 Stitch Fix is a service in which members complete style profiles and, for $20, a stylist chooses five pieces to send on pre-determined delivery schedules. You can take the $20 off whatever you decide to keep. I filled out my profile and excitedly awaited my first box. 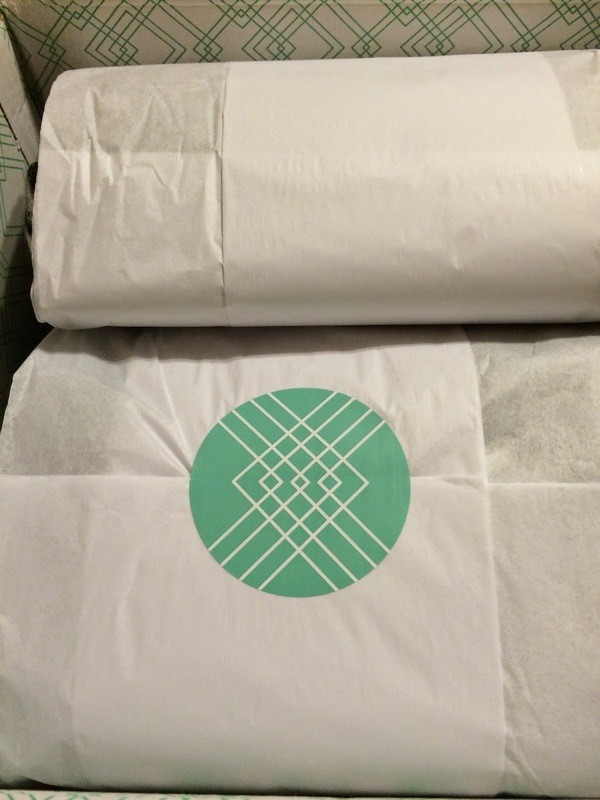 Everything was neatly folded and white washed in tissue paper and Stitch Fix logo stickers. Tucked inside was a personalized note from my stylist and suggestions for integrating the selected pieces into my existing wardrobe (as well as with each other). Interestingly, my stylist's name is also Kelly. Piece #1...An Echo infinity scarf. 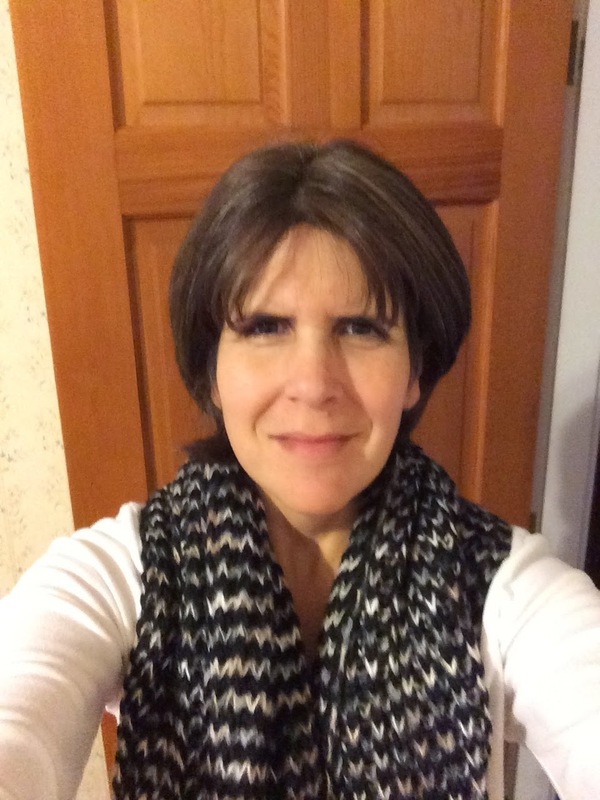 I own far too many scarves, but this one was so soft and neutral, it was a no-brainer. 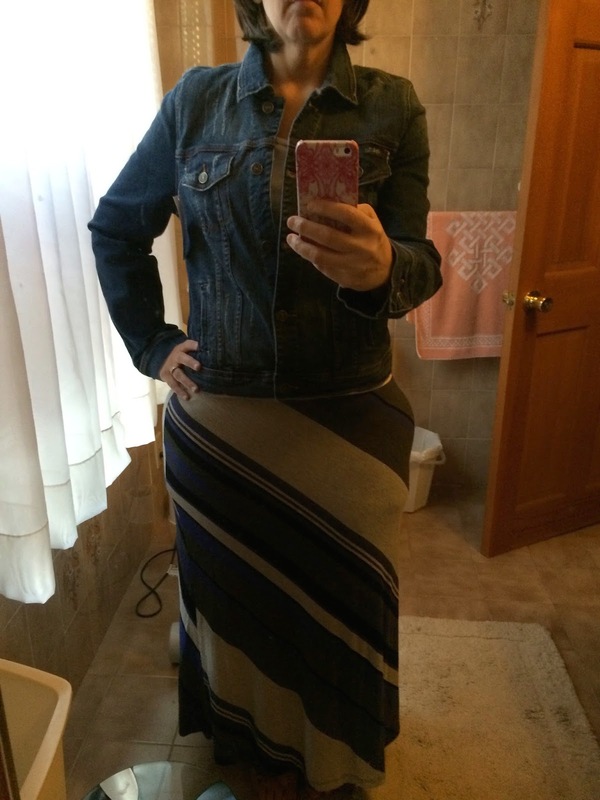 Pieces #2 & #3... a Morrie medium-wash boyfriend jean jacket and Christi diagonal striped maxi skirt. Ordinarily these would be keepers, but the lines on the skirt are awful for my bottom-heavy pear shape. And the jean jacket, although cute, had shreds on the back like I had been in a fight with a werwolf. And, I already have a cute jean jacket. This was too similar to something I already have in my summer wardrobe. And, with winter coming, it just is not practical right now. Who wants to wait until next summer? Sorry for the partial photo....SO not a fashion blogger. What I loved about this was how it fell on my shoulders, which you cannot tell from this picture. And I loved the gathering at the waist. And my husband loved it. A win-win. 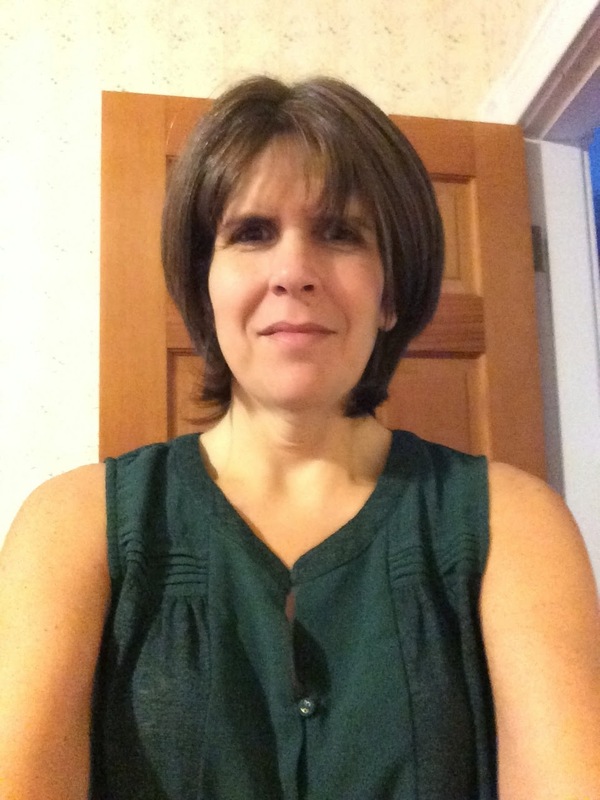 I wore it on our weekend getaway to New Brunswick over the Columbus Day weekend. 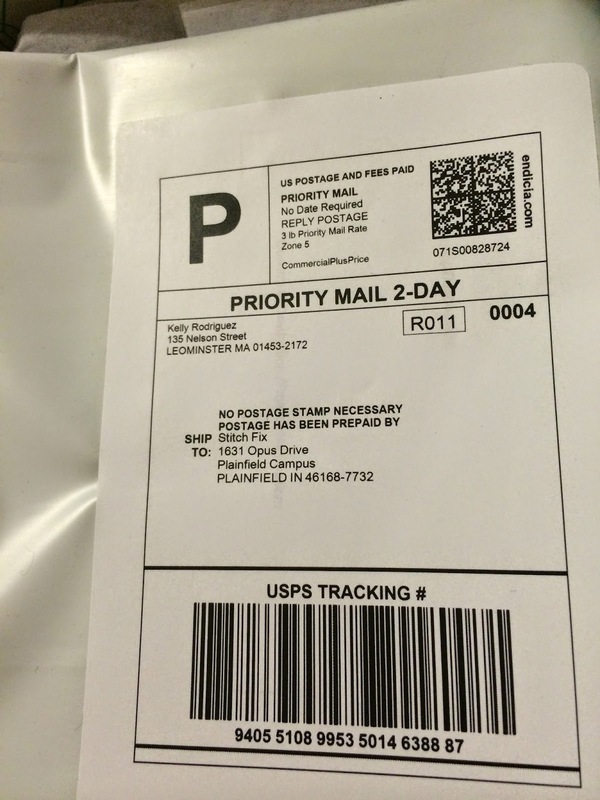 Stitch Fix includes a USPS postage-paid envelope for you to return your unwanted items within three days. You check out online and take your $20 styling fee off whatever you choose. If you keep all five pieces, you get a 25% discount. It wasn't a bad first box. At the very least, I am hoping I end up with a few pieces I may not have chosen for myself. I'm looking forward to my next Fix. 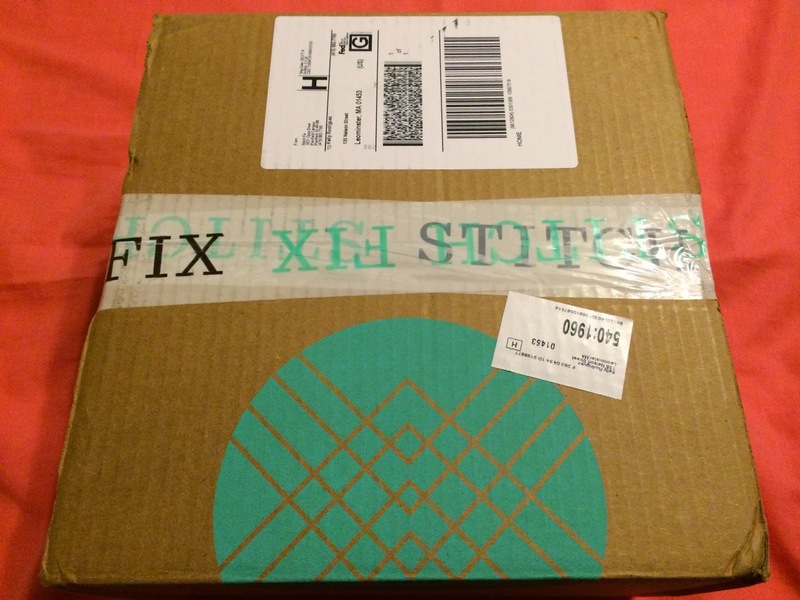 Are you a Stitch Fix subscriber? And if not, do you have a monthly subscription service that you love? It's such a hot industry right now. Why didn't I think of that? This is the first I have heard of them!! What a fun subscription idea! I really don't like to shop so this might be fun!! Thank you, Evelyn. I don't like shopping either and I have never had a subscription service, so this was my first go-around. I can't wait to see what comes next month. I told myself I would give it three months to try. Thank you for stopping by. Wow! I say not too bad for a first time...and I am glad you returned the skirt. Stripes are always a no no for everyone in my opinion. Even if a woman is 5'10" and a size 6 they still shouldn't wear stripes. I think the jack if paired with a vintage necklace or a bit of sparkle would glam it up a bit, but you are the one who has to wear that one so if your not comfy then don't force it! I do absolutely love that black shirt on you tho! That was a good choice!! Thank you, Christine. I have never had a subscription service, so this was my first go-around. I can't wait to see what comes next month. I told myself I would give it three months to try. I really like the black top. :-) Thank you for stopping by. This is an interesting service! I've heard of it but haven't seen it in action before, and haven't thought to try it because of my larger size. I tried out Gwynnie Bee for a month but had to stop because it was too expensive for me at the time. Maybe I'll try it again...it's been greatly improved since I was a member. For what it's worth, I thought you looked great in the maxi skirt! Thank you, Esther. I have seen Gwynnie Bee, but I haven't looked much into it. I have never had a subscription service, so this was my first go-around. I can't wait to see what comes next month. I told myself I would give it three months to try. Thank you for stopping by. I have done this twice and really liked it. Although, most of the items were more money than I would usually have spent. Love the black top! I agree, Kate. The items are pricey. I have never had a subscription service, so this was my first go-around. I told myself I would give it three months to try. But I don't want to overspend and buy more things I normally wouldn't choose. We'll see. I know a few that use this service and love it. I have never had a subscription service, so this was my first go-around. I can't wait to see what comes next month. I told myself I would give it three months to try. Thank you for stopping by, Lynn. I love what you kept. I agree it is not worth keeping something just to have to wait till the summer. Thank you, Kerry. No...I need warm clothes. :-) We'll see what comes next month. I have seen this and wondered if I would like it... I just might have to give it a try. I have never had a subscription service, so this was my first go-around. I can't wait to see what comes next month. I told myself I would give it three months to try. Thank you for stopping by, Marlys. Thanks for the idea -- sounds great. I never have time to shop. I liked the top on you. Thank you. :-) I like the black top too. I have never had a subscription service, so this was my first go-around. I can't wait to see what comes next month. I told myself I would give it three months to try. Thank you for stopping by, Carol. oh FUN! I might have to give it a try! I hope you like it. :-) Thank you for stopping by, Heather. I've tried other subscriptions boxes before that were beauty products, but I haven't tried one with clothing. I might have to give it a chance! It's an interesting concept. I have never had a subscription service, so this was my first go-around. I can't wait to see what comes next month. I told myself I would give it three months to try. Thank you for stopping by, Tracy. This is sounds really cool ! I'm a subscriber and my first box was AWFUL. The next two, I've found keepers. Good to know. I am looking forward to seeing what comes next. :-) The Totes Bubble umbrella is fabulous, by the way. :-) Thank you for the recommendation!